Basketball is a fast sport, filled with defensive pressure, quick passes and meticulous technique that could make or break the game. Little room is left for error. When this amount of pressure is put on players it is no wonder that many teams have resorted to yoga and alternative therapies as a mental release. For the Concordia Stingers men’s basketball team, the release is group meditation. A group of 6’5” giants sitting in a dark room and sharing a soothing meditation moment with their coach before a game may seem strange. For Concordia head coach John Dore, though, the positive results speak for themselves. It all began when Dore was approached last year by Rob Hart, a former University of Arizona football player. Hart holds strong beliefs about the power of meditation in sports, and he had an idea for Dore. So what exactly is this meditation experience? “Most of the guys like it, it’s a team thing,” said Stingers guard Decee Krah. Indeed, over the years more and more professional athletes and teams have been embracing meditation, including the Chicago Bulls and the Los Angeles Lakers. “There’s a lack of self-consciousness, there’s a relaxed concentration, and there’s this sense of effortlessness, of being in the flow,” he said about player meditation. According to the book Cognitive Models and Spiritual Maps by Jensine Andresen and Robert K.C. Forman, meditation has been proven to reduce heart rate and blood pressure, reduce chronic pain and improve sense of well-being. The Stingers said that they visualize themselves successfully executing their plays in their minds while they meditate. 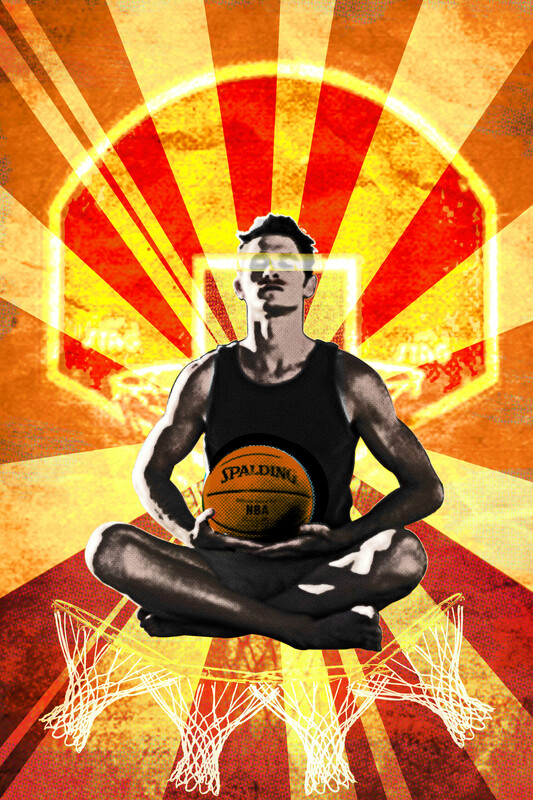 Desmarais said that although people may be sceptical, he personally felt the positive effect of meditation on his performance on the basketball court. “I remember last year when I started my meditation, my free throws were something I really wanted to improve, and while I was doing the meditations I was shooting them at about 80 per cent, and then I stopped doing meditation, and it dropped down to about 60 per cent,” he said. “I started again this year and so far I am 100 per cent from the free throw line,” he said with a grin. Dore can agree with Desmarais. “When you go into shooting free throw you want to remain calm, so if you know how to breathe properly you can slow your heart rate and you can calm yourself down,” he said. After adding group meditations for five minutes at a time before and after a game, the Stingers haven’t looked back. If the meditation keeps working, Dore isn’t going to mess with the winning strategy.